In comparison to traditional surgery, laparoscopic surgery for cats is a minimally invasive alternative and typically results in shorter recovery time. Similar to arthroscopic surgery, your veterinarian will make one or two small openings in the cat’s abdomen and insert both a camera and the surgical tools required to complete the procedure. This allows our veterinarians to visualize the organs and the abdominal cavity through what is called a “keyhole”, perform the operation and exit the body without creating incisions that are any larger than absolutely necessary. This type of surgery is typically used for spaying cats, or to perform a biopsy of the liver or intestines. Should your vet need to take several samples, laparoscopic surgery is the safest and the least invasive way to collect samples for a diagnosis. Laparoscopic surgery is also used to view the abdominal cavity for any abnormalities. Since it is minimally invasive, cats will typically experience less pain and and a quicker healing time. In order to prepare your cat for a laparoscopy, you should follow your vet’s instructions. Typically, your cat will recover from the anesthesia in your vet’s recovery area. You will then be given a set of instructions for your cat’s care and be sent home with your cat to rest and recover. Follow the instructions that your vet gives you. Home care instructions will vary depending upon what type of surgery is performed. 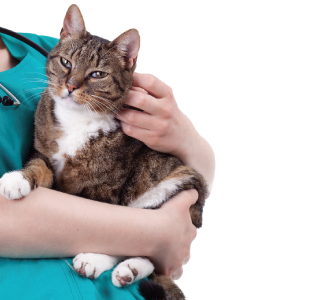 Generally, your cat should recover in 12-24 hours after the laparoscopy surgery. If your cat shows any signs of distress call us immediately at Riverbark Veterinary Hospital and we will give you instructions on how to handle this situation. Don’t encourage any strenuous activity for a couple of days. Keep your cat quiet, monitor their activity and keep them indoors for a few days. Each and every patient is different and is dealing with a different recovery based upon the procedure, so we strongly recommend that you follow the personalized instructions our veterinarian provides for your cat. If you are looking into surgical options for your cat, please call us at Riverbark Veterinary Hospital and talk to a veterinarian about the benefits of laparoscopic surgery for cats.